Dinner parties. It’s a time for pretty table linens, elegant dinnerware and culinary flights of fancy. A time in which my little apartment kitchen seems all too tiny and I start dreaming of a spacious farm kitchen, complete with brick walls and weathered wooden family table. When I was a child, our house was usually filled with dinner guests on Saturday evenings. My brother & I knew the kitchen was off-limits for pretty much the entire afternoon, as mom was in there whirling like a tornado and mostly cooking a 6-course meal for guests that would arrive later in the evening. Setting foot on the tile kitchen floor, meant the risk of being sucked into mom’s dishwashing vortex so we generally steered clear. (*) Note to self: Must fight this genetic pattern before hot pink capris become all the rage. Yesterday, J. was coming over for dinner. She had to drop off some papers, so – naturally – I suggested I cook dinner for all of us. I had planned on cooking a big pan of my lemon-braised chicken and serve that family-style, since I had to work all day and didn’t have much time whip out my whole arsenal of culinary wizardry. Lemon braised chicken has such a unique flavor, that it’s always a bit hard to find a side dish that will accompany it flawlessly without being blah, but the orzo below did just the trick. The roasted vegetables burst with flavor and are slightly caramelized which brings a note of sweetness, while the lemon dressing breaks that sweetness with the right amount of tang. The freshness of the scallions and basil not only adds to the wonderful flavors, but also makes this really pretty t look at. Place the peppers, onions & eggplant on a baking sheet, sprinkle with salt & pepper and coat liberally with olive oil on all sides. Roast in the oven until tender and caramelized, approx. 30-40 min. Set aside and allow to cool to temperature. Turn off oven. In a small sauce pan, toast pine nuts until golden brown. Set aside and cool. Zest 3-4 lemons, and set zest aside. Slice scallions and basil, and set aside. For the lemon dressing, juice zested lemons into a measuring cup or bowl. Preferably one with a pour spout. You should have approx. 1/2 cup of lemon juice. Add about 3/4 cup-1 cup of olive oil to the lemon juice and blend well. Add salt & pepper to taste. Add pureed roasted garlic to the dressing, if you desire. Bring a large pot of liberally salted water to a boil, and cook orzo according to package instructions. Drain well and pour into large serving bowl. Immediately, while hot, pour about half of the lemon dressing over the pasta, and coat well so it won’t stick as it cools to room temperature. 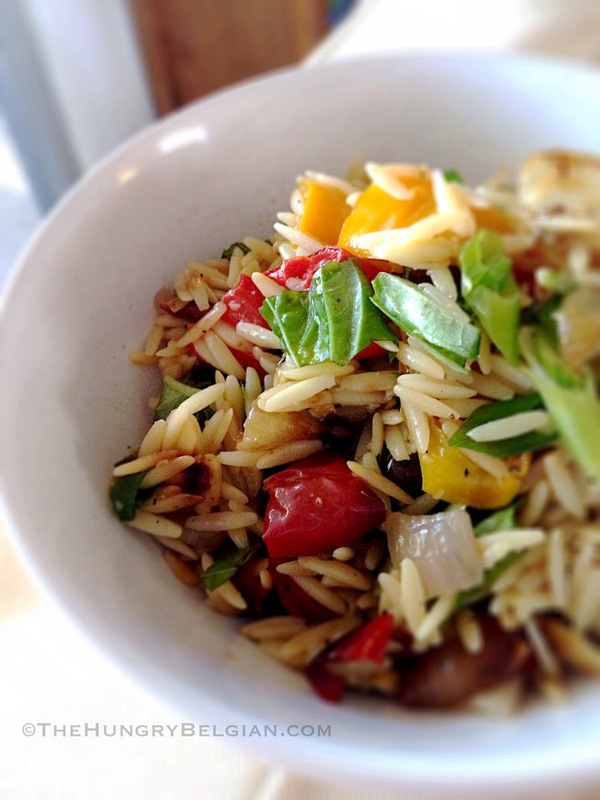 When pasta is cool enough to handle, add roasted vegetables & lemon zest to the orzo, and gently fold until well combined. If the pasta salad seems a bit dry, add some more lemon dressing. Fold in toasted pine nuts, scallions and basil. keep a few basil leaves for decoration. You can eat this pasta salad warm or cold. This recipe will make a large bowl that will comfortably feed 8 people or more. It can be served as a side, or with crusty French bread for a light lunch.